Marker Text: First Bryan dates its founding to the constitution of the Ethiopian Church of Jesus Christ under Rev. Andrew Bryan in January 1788, making it one of the nation’s oldest African-American Baptist churches. Known later as First Colored Church, First African, and Third African, the congregation took the name First Bryan Baptist in 1867. Construction of the first church building began here in 1793 on property purchased by Reverend Bryan. The current building was completed in 1874. First Bryan ministers including Garrison Frazier and Ulysses Houston attended the nearby meeting of local black leaders with Gen. Sherman in January 1865 that resulted in Special Field Orders No. 15, promising confiscated coastal land to freed slaves. In the twentieth century, Civil Rights leader W.W. Law taught Sunday School at First Bryan for many years. 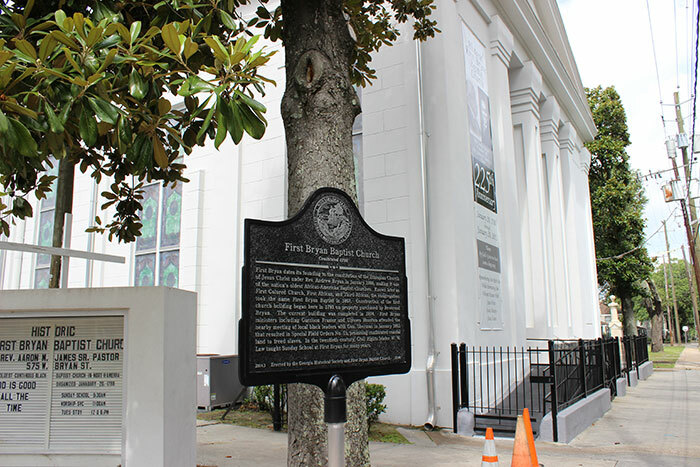 Tips for Finding This Marker: South side of West Bryan Street between Ann Street and Fahm Street, to the left of the church in Savannah.